Seven months ago, Canadian-based Score Media lauched ScoreMobile for BlackBerry® smartphones. In this short time frame, the free application has been downloaded one million times, which Score Media reports as "a significant milestone for the industry-leading mobile sports application." With a version also available for the iPhone®, Score Media told Eye on Sports Media that over 60% of the application users are actually from the United States (This cannot make ESPN very happy), and that the service is available from any location. 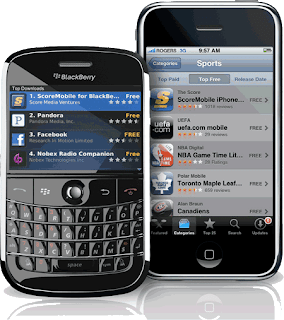 The application was recently rated by PC Magazine as a Top 20 Free Application for BlackBerry smartphones, and ScoreMobile now attracts over 40 million monthly page views. “ScoreMobile makes it simple and easy for users to follow sports in real-time, and is a great example of how the BlackBerry platform can be leveraged to provide an even richer user experience,” said Jeff McDowell, Senior VP, Business Marketing and Alliances, Research In Motion.